A 1975 Sears Manual 1 portable typewriter. In all its mass-produced glory. For a piddly three bucks. It has an ancient ribbon, and it’s missing a key, but it does still work, and is technically a “portable” model (I say “portable” in quotations because it’s probably close to 15lb, and buying it early in the day caused both of my shoulders to hurt by the time we reached the car). All I need is a flannel shirt and enough fair for a man-bun to be “that guy” at Starbucks writing that earth-shattering screenplay. To be honest, I know very little about my typewriter model. Looking it up hasn’t so far come to many conclusions or interesting information, other than that it was actually made by the company Brother and not Sears as the label states. This isn’t even surprising, knowing the video game history I do; the Atari VCS/2600 was sold at Sears as the Sears Video Arcade with games as “Sears Telegames”, so why wouldn’t they do the same with other electronics and productivity devices? But why would I buy such a model, released into the world the same year the Vietnam War came to an end and “Squeaky” Fromme tried to shoot President Ford, in 2018? Why would I bring this heavy and intricately-assembled metal beast into my home-bedroom? But not just ANY nostalgia. See, I’m in my mid-30s now, and there have been some noteworthy changes between the things I grew up learning and experiencing that kids of that age won’t be seeing today. And in this case, that would include typing classes. Because I didn’t learn to type on a computer – even though there were computers in my home going as far back as I can remember – but instead on a manual, just-like-my-$3-purchase typewriter. Because of that, my middle school had a room filled with around 30 typewriters. Just row after row of bored 14-year-olds thwacking the keys and complaining that they pressed too many keys too quickly and jammed the thing up. 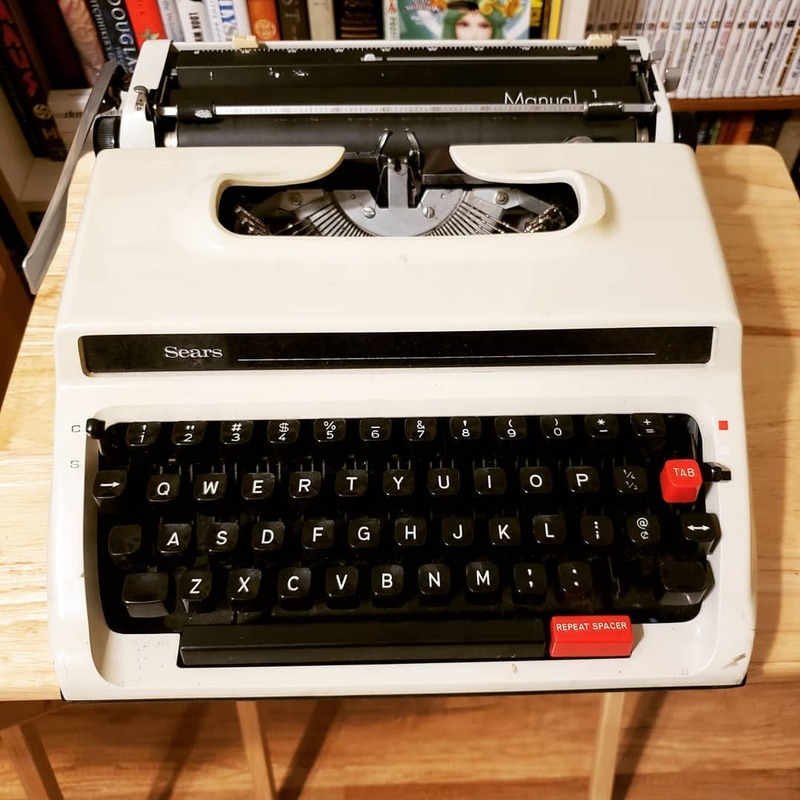 That was a real problem… to this day I know that, in theory, people could type over 60 words per minute on a manual typewriter, but I have no actual concept in my brain as to how. I might’ve reached 20 or 30 then, but that was through sheer determination. The only other thing I remember about that class was a teacher telling me they could program their own website. Remember, this was 1998, so HTML was still some hot stuff, yo. (I could program my own site too, and it probably looked just as solid as any Geocities abomination he’d made, the egotistical jackass.) I didn’t learn how to touch type until I started through college in the early 2000s thanks to hunt-and-peck techniques and manual typewriter classes. Now, I look over that class and my “new” machine as a timeline connection point. Even in that class, bored as I was – I was 14, every 14-year-old is bored, it’s in the rulebook – I still loved seeing those typewriters. Even back then I loved telling stories, which helped me to eventually become the aspiring story writer and poet I become in my early high school years, and the thwack of a manual typewriter just pumps me up to getting my thoughts onto paper. It’s probably not going to be one page at a time while worrying about replacing ribbons or jamming the hammers all up, I do love modern word processors something fierce, but I could see myself testing out some poetry on my mechanical wonder should the spark threaten a fire. And either way, even if it’s never used again, for three measly dollars it’s a token of a time long since passed. Even if it wasn’t “my” machine, it still takes me back to “my” era, and connects me in some small way to the writers that came before me like my fountain pens have done. Which reminds me… I think I’ll start practicing my cursive a little too. That takes me back even further. Stand Tall and Type Well, friends. May your stories be lovely and your ribbons be plentiful.